Two fads for 1894, bicycling and woman's suffrage. I didn't know there was a season for suffrage, no wonder it took so long. The World's and National W.C.T.U. I have been asked how I came to adopt the fad of bicycling. I adopted it, first of all, in England, as a sort of medicine. It was recommended to me by Sir Benjamin Ward Richardson, probably the best known hygienist in England. He recommended the bicycle to me for my health. Lady Somerset presented it to me. She bought a tricycle, and together we used to ride about the grounds of her estate. 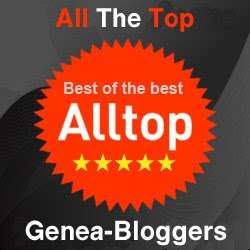 I think if one has a fad, a recreating fad, one should adopt the fad which gives most health. Bowling for women is good in a measure, but it develops one arm while it leaves the other weak, and is, besides, a form of recreation too often carried on indoors in an overheated room. But for filling the lungs with good, pure air, clearing the mind, and bracing the nerves, bicycling is the best. I call bicycling walking six inches above the ground. My two guiding mottoes in learning were "I will not fail," and "It's dogged as does it." With the aid of these, together with the help of three young women assistants, I learned to ride in thirty hours. I went first with three assistants, then with two, then one, then without any, though they usually accompanied me even after I learned. I have brought my wheel from England with me, and shall probably ride out at my home in Evanston. I learn that the two reigning fads in New York just now are woman suffrage and bicycling. Now woman suffrage is all right in season; but in the warm months let the girls take up the bicycling fad in earnest. I like to see as many girls riding as men; and on all the wheels ridden by both men and women I'd like to see the white ribbon floating. Please note that in the photograph of Willard she wears the white ribbon of the WCTU. 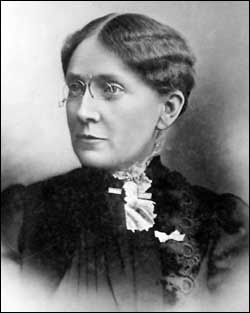 Frances Willard - Elected president of the United States Woman's Christian Temperance Union in 1879, a position which she held for life. Willard died of influenza February 17, 1898, in the Empire Hotel, New York City, New York. She is buried in the Rose Hill Cemetery, Chicago. white ribbon floating - The White Ribbon has been the badge of the Woman's Christian Temperance Union since its founding in 1873. The WCTU is the oldest continuing non-sectarian womens organization worldwide. The white ribbon bow was selected to symbolize purity. Kent, Antoinette Cowles. "Frances E. Willard." Sketches of Wisconsin pioneer women. Fort Atkinson, Wis. : Hoard & Sons, [1924?]. Willard, Frances, "Her Fad Is Bicycling." Demorest's Family Magazine, September 1894, 146-148. Unknown, photographer. “[Frances Willard, portrait bust]” Glass negative. Washington, D.C. : Library of Congress, 1867. From Library of Congress: George Grantham Bain Collection, [no date recorded on caption card]. (accessed September 19, 2008). 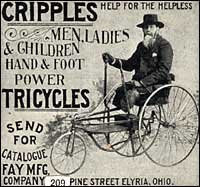 Unknown, "Tricycle Advertisement" Demorest's Family Magazine, September 1894. 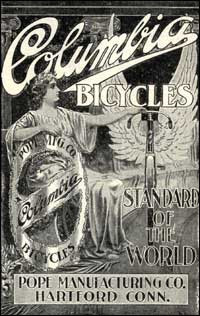 Unknown, "Columbia Bicycle Advertisement" Demorest's Family Magazine, September 1894. Frances is my distant cousin; our common ancestor was Major Simon Willard. My children attended (Frances) Willard Elementary in Spokane, Washington. There are many schools around the country named for this great woman of education, the first female president of a major university (Northwestern).